Welcome back! Once again, we’re testing lenses and sharing our results with the community. As goes with all tests that I perform, please do take this with a grain of salt. We did our best to maintain a consistent baseline throughout the entire test. 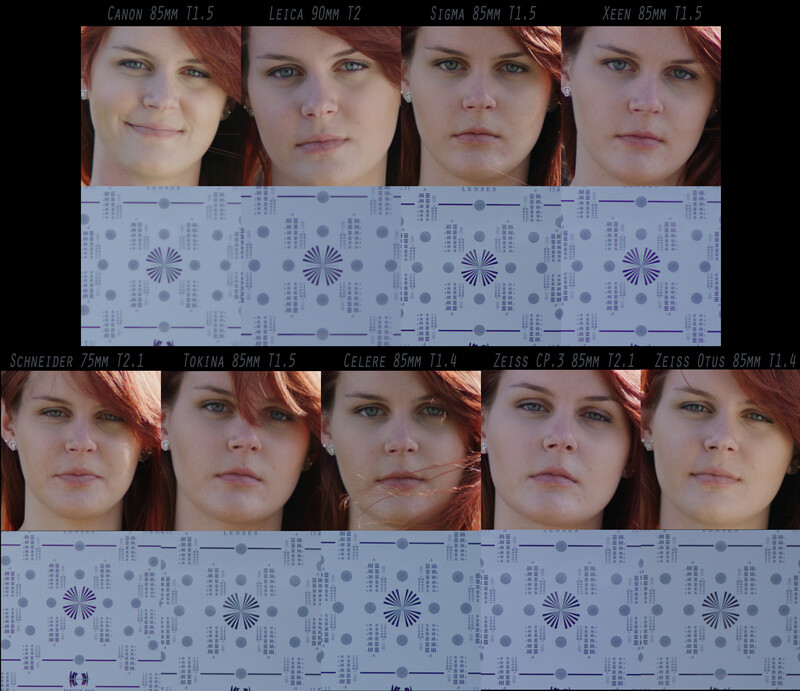 All shots were done in the exact same test environment, same lighting, same camera settings, etc. The notable variables will be for the 8KS35 portion which was shot outside, obviously you’ll see a subtle difference in lighting since it was an outdoor shoot. The indoor scenes on 8KVV will be very consistent. We built a small set in the back of the Duclos Lenses machine shop, adding a ton of optical performance traps - items to draw out CA, distortion, color shift, etc. Tests like this can be a great tool for A/B/C/D comparisons. I would never compare this test with someone else’s test since there are FAR too many variables. No matter how much you test lenses, you’ll find that, on a camera, the results will always change with your conditions. Our goal with this test was to shoot as many “large format” (VV) lenses in the same scene as possible for you all to consume. So grab some popcorn, roll through the clips and enjoy! Our Key Light illuminating Jennie is a Litepanel Gemini, beyond the pleasing soft light everything was placed in consideration of moderately stress testing the lenses. 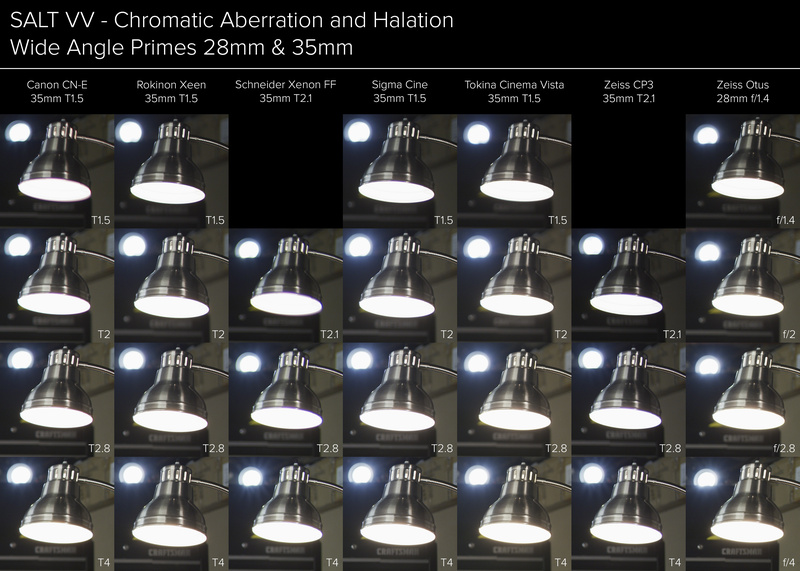 We have multiple point sources exposed at just above clipping to reveal chromatic aberrations, internal reflections, flare characteristics, bokeh, etc. Objects in the foreground through the background are useful to inspect the focus pull, draw, distortion, and lens breathing. The shot design is at the beginning of each shot the rack focus starts about one quarter turn before locking critical focus on our subject, we then pan with her as she grabs the flashlight, then pan with the flashlight directly at camera to inspect lens flare. Lastly rack from close to infinite, back to close, close to chrome lamp, and back to talent. Each take is about a minute long. Who's involved this time around? 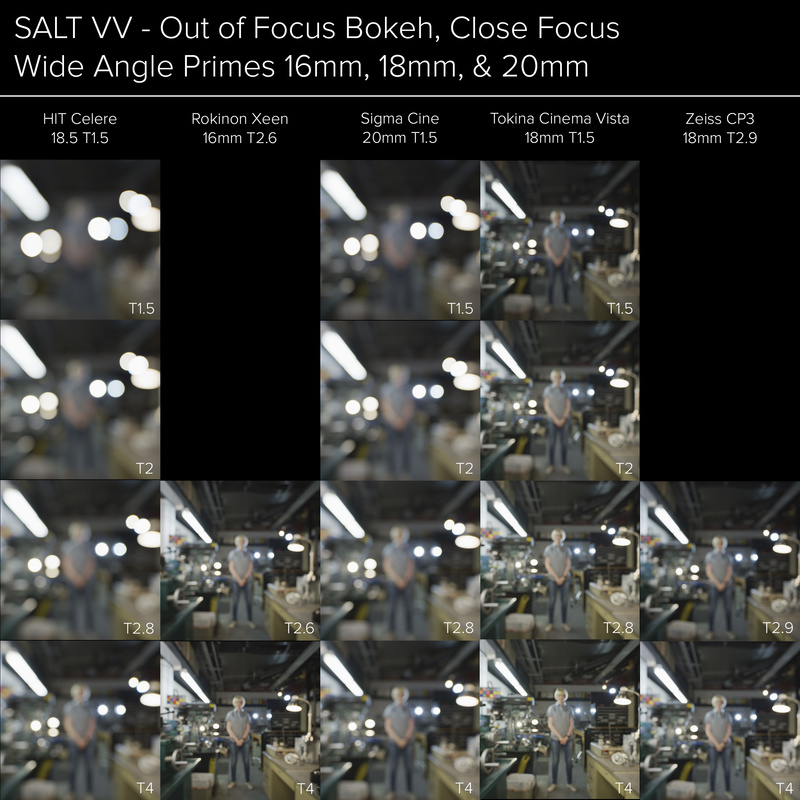 A good spread of focal lengths and among the fastest lenses tested considering the 50mm and 85mm T1.3, the CN-E primes really shine in regards to consistency. The image quality was familiar and predictable which is no surprise given the optical design is inherited from Canon’s esteemed L Series of primes. The 14mm showed very minor signs of vignetting on the VV sensor which is respectable. It would easily be eliminated by shooting at 8K WS/HD. The flares resulting from the direct flashlight test are interesting and somewhat varied throughout the set, but one thing that stood out to me with the CN-E was the quality of the bokeh. 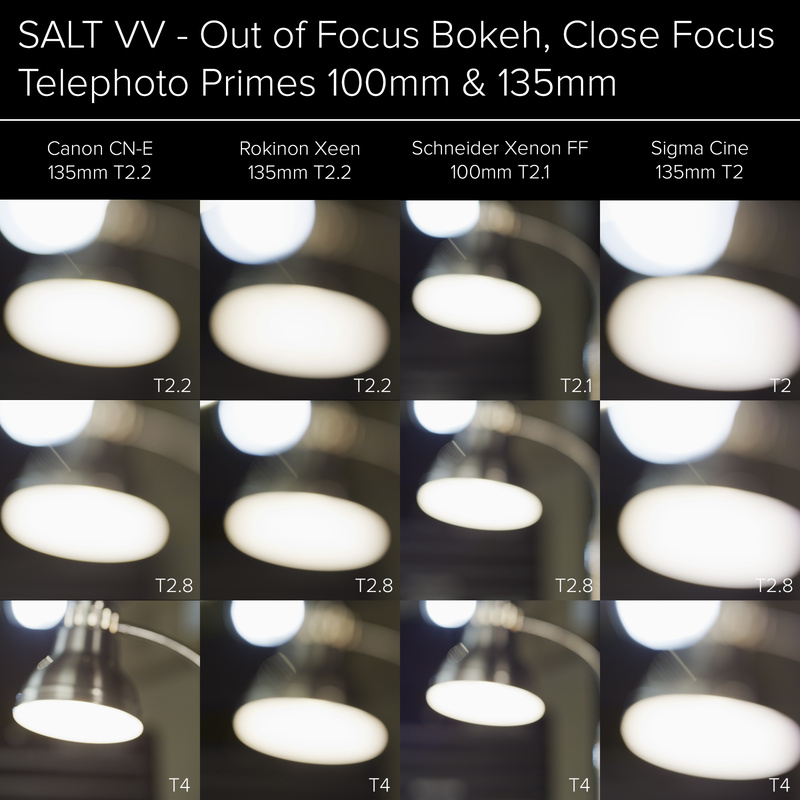 Even at smaller apertures, the bokeh remains beautifully round and consistent. The build quality of the set as a whole is nice. Focus rotation is generous, marks are clear and plentiful. Gear diameter and position is the same across the set - just what I’d expect these days. The biggest downside the the CN-E primes is their lack of mount options. They’re only available in Canon EF mount unless you have Duclos convert them to a hard PL. However, they DO offer data through the EF mount, similar to the Sigma Cine primes - none of the other lenses we tested offered metadata through the mount (CP.3 XD will offer this when they’re released). This is a difficult one for me… I kept my mouth shut for the most part in regards to the quality and origin of the Celere primes, especially after they threatened me with a lawsuit publicly on their Facebook page. But this test is about honesty and unbiased results. I’ll start by saying that the entire set suffered from mechanical issues with the 36mm jamming up entirely during the first take. I’ll can chalk this up to a “bad egg” but the rest of the set still didn't feel anywhere near as high quality as the rest of the lenses we tested. The image quality was decent at best. The flares from the direct flashlight were relatively uncontrolled but still interesting (subjective). What isn’t subjective is that the Celere glass is simply repurposed Rokinon/Samyang optics. Nothing wrong with that… But we’re being honest here so it’s worth noting. 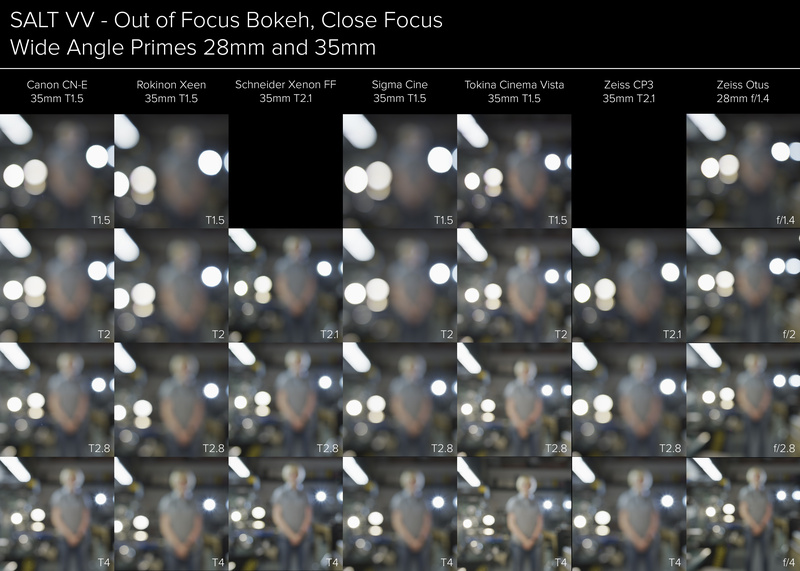 We tested the entire line of Rokinon Xeen primes in this test as well. I invite you all to compare side by side. With the exception of the 24mm, which has a severe coma issue in the Xeen, the results are identical. You can also compare the field of view of the “36mm” Celere and see that it’s identical to the 35mm Xeen. Same goes for the “25mm” Celere and the 24mm Xeen. So you may be asking what about the “18.5mm”? Again, you can compare in the test, it’s simply a rehoused Sigma 20mm. Test results aside, removing just a few layers of the Celere lenses exposes their origin pretty quickly. You can also observe a substantial amount of vignetting in the 18.5mm and the 25mm. As I said, overall the optics performed decently, but no better than the Xeens and in some cases, actually worse on VV. The value option of the bunch - the Xeens get knocked a lot for their name and their price. Some of that is justified. For example, observe the severe coma in the 24mm in this test. I plucked a random lens off our shelf and thought about swapping it out. But once again, we’re not doing the manufacturers any favors in this test so I opted to leave it as is to show what you COULD get with a Xeen. Yes, you can cherry pick the Xeens, but I wanted to show a real-world result in the test. The flares are interesting, especially towards the edge of the frame. 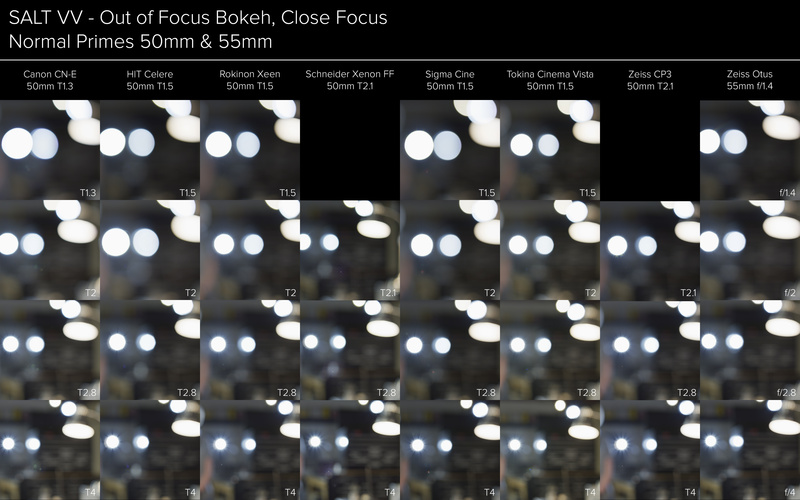 Bokeh is decent but not always as round as it could be at the wider apertures. Any CA that was observed wide open, cleans up pretty well by dropping down a stop. What really stands out to me is the build quality of the Xeens. It’s not better than the pricer lenses in this test, but for what these lenses cost… It’s an impressive mechanical operation. Smooth, consistent focus pulls with generous rotation. Once again, the gear position and barrel size are consistent. My biggest complain is the fact that these lenses could have been made much smaller and lighter. The massive metal sleeve that is the Xeen body, could have been as small and light as the Celere primes. 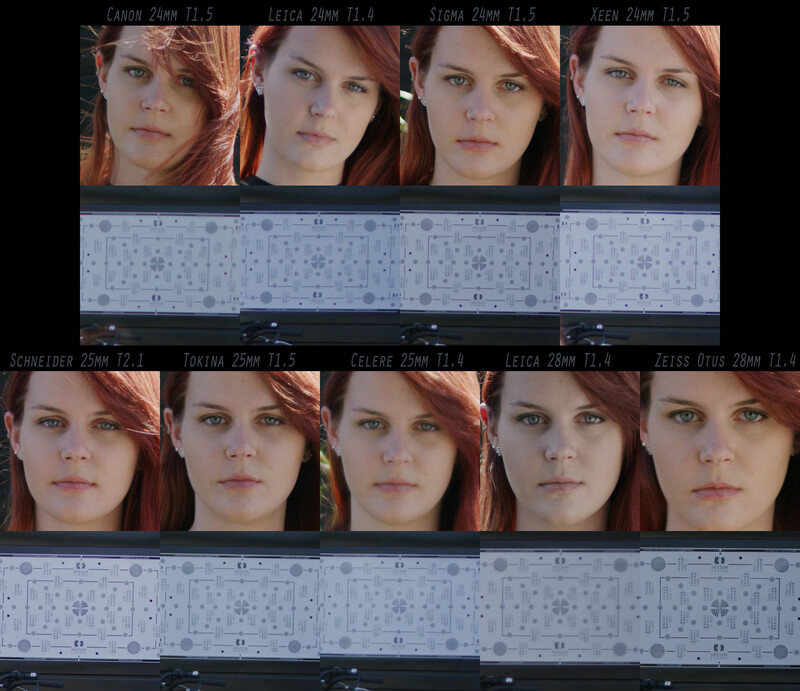 I also noticed a decent amount of color variation from lens to lens which is also something to expect. You won’t find color consistency in the Xeens without cherry picking. Overall, the Xeens performed well, especially stopped down. Tested in PL mount, but the Xeens offer an interchangeable mount between PL, EF, F, and E mount. 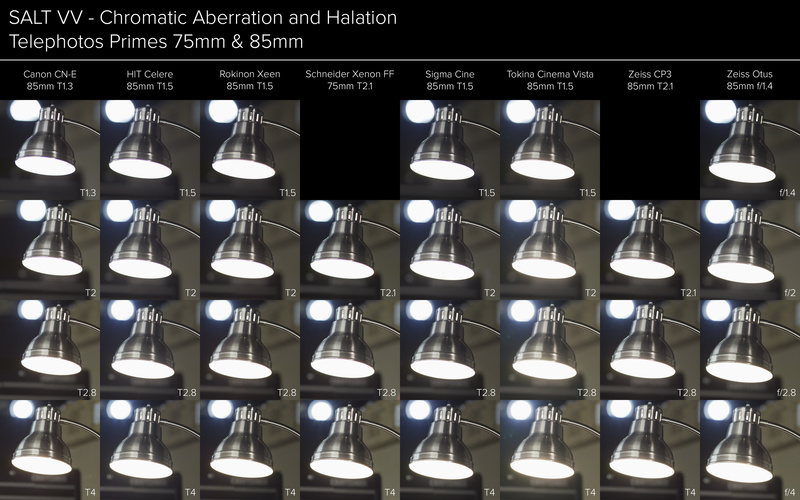 Unfortunately we couldn’t get our hands on the elusive 18mm Xenon for this test, but we did have the rest of the set. 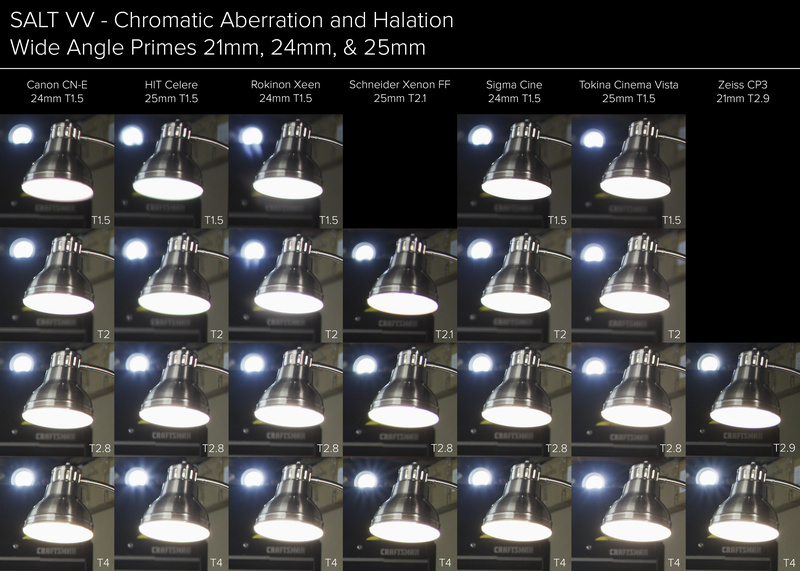 I think what stands out most to me with the Xenon primes is their “classic” feel. Yes, some could consider that a sugar-coated way of saying they are soft or the flare a lot… But to me they do have a classic “hollywood” look to them. The 25mm may be the best example of this. The corners soften up just enough with a notable about of SA. 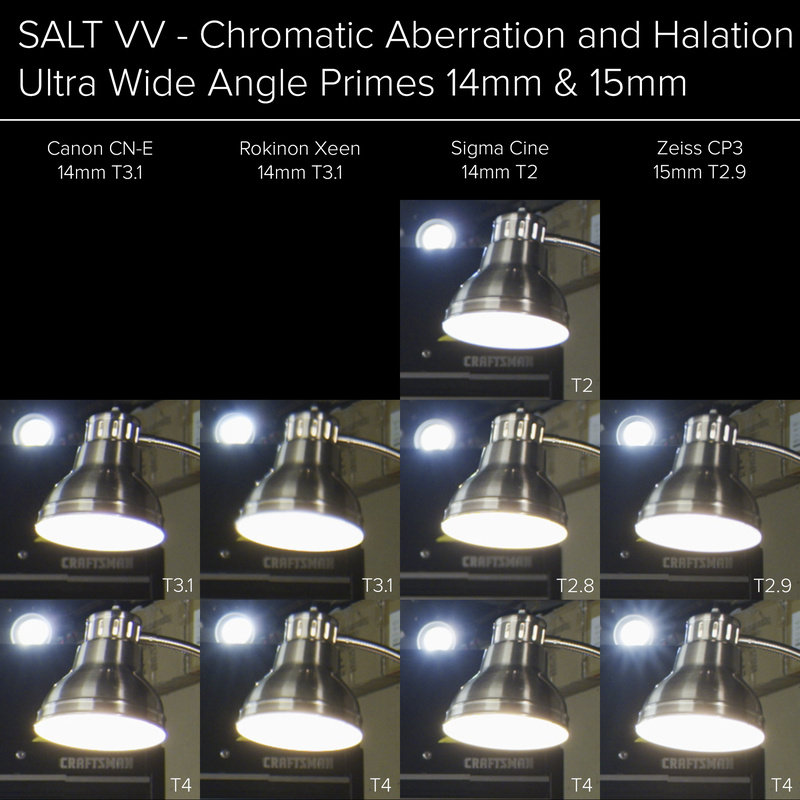 Chromatic Aberration is fairly apparent across the set, even at smaller apertures. Color is consistant across the set with a touch of coolness to it. Flares are predictable and exhibit a nice combination of blue and magenta flavor. 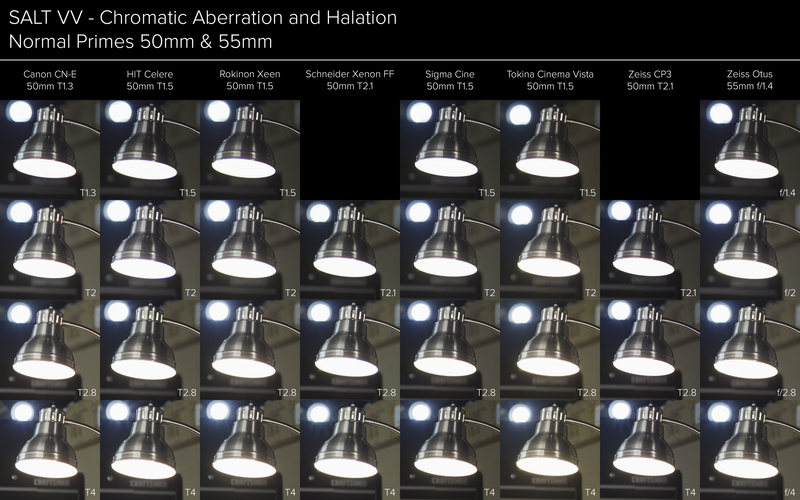 Tested in PL - the Xenons are available in PL, EF, and E mount. The Xenons also had the slowest average speed with each lens being a T2.1 aperture max. 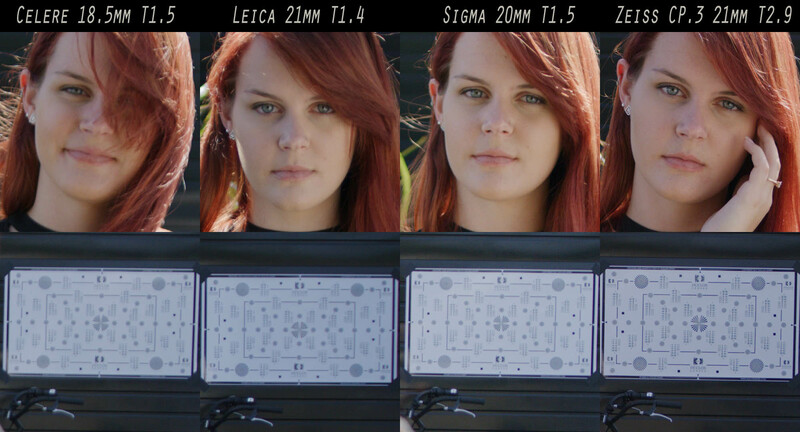 The Sigma Cine primes were among the newest lenses tested. While the glass is indeed inherited from their ART line of prime lenses, it absolutely shines on the VV sensor. Coverage was excellent, even all the way to 14mm which exhibited the slightest vignette in the very corner of 8KFF. Bokeh was beautiful across the line and CA was very well controlled. 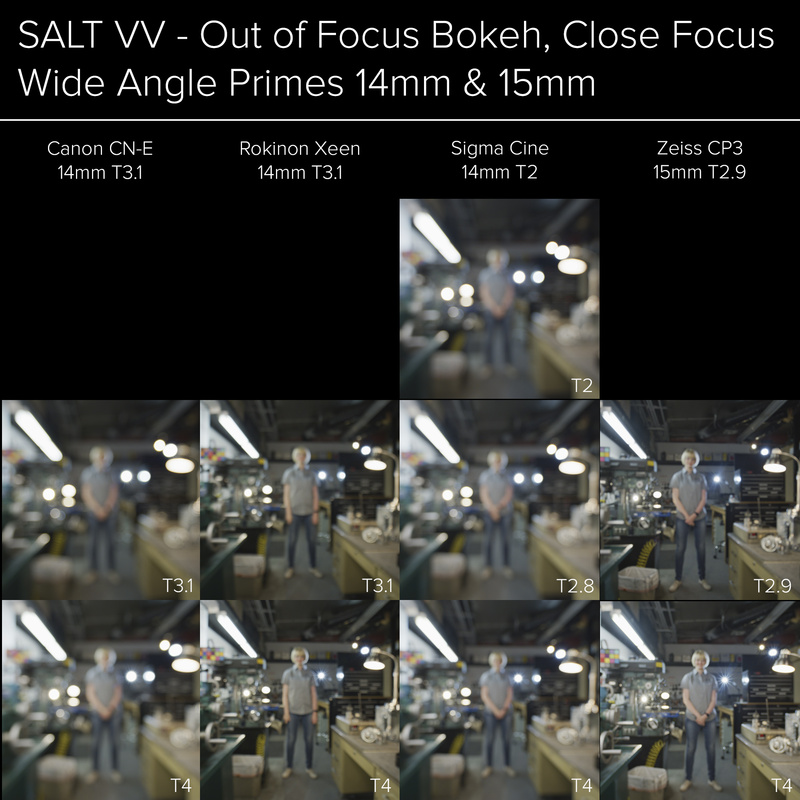 Focus breathing is apparent most in the 14mm but in the “normal” focal lengths, it’s very well controlled. The mechanical design and build is excellent. They’re compact, sturdy, and consistent gear position and barrel size across the line. The focus rotation was what I would consider the bare minimum at about 200 degrees. The short throw can be seen as a benefit or a liability depending on how you shoot and the accessories you’re using. Flaring was well controlled and pleasant in our direct flashlight test. The 14mm and 135mm are an engineering achievement being T2.0 which you won’t find in any other set of primes with comparable coverage. These primes are impressive. Aside from the Schneider Xenon FF primes which are a bit long in the tooth, the Tokina Cinema Vista are the only purpose built cine lenses in this lineup. Their size and weight is right on par with their image quality. They performed very well in controlling CA, distortion, and focus breathing. It’s worth noting that the 18mm that we had was a pre-production prototype which still performed quite well. The 50mm did have some strange effects with light bleeding, most likely the result of multi-asphere design, which Phil and I had noted much earlier in the release of the Tokina primes that we hope is being looked into at the factory. Optically, the Tokinas performed great. Their size and weight is worth noting as they were by far the biggest and heaviest primes in this test. 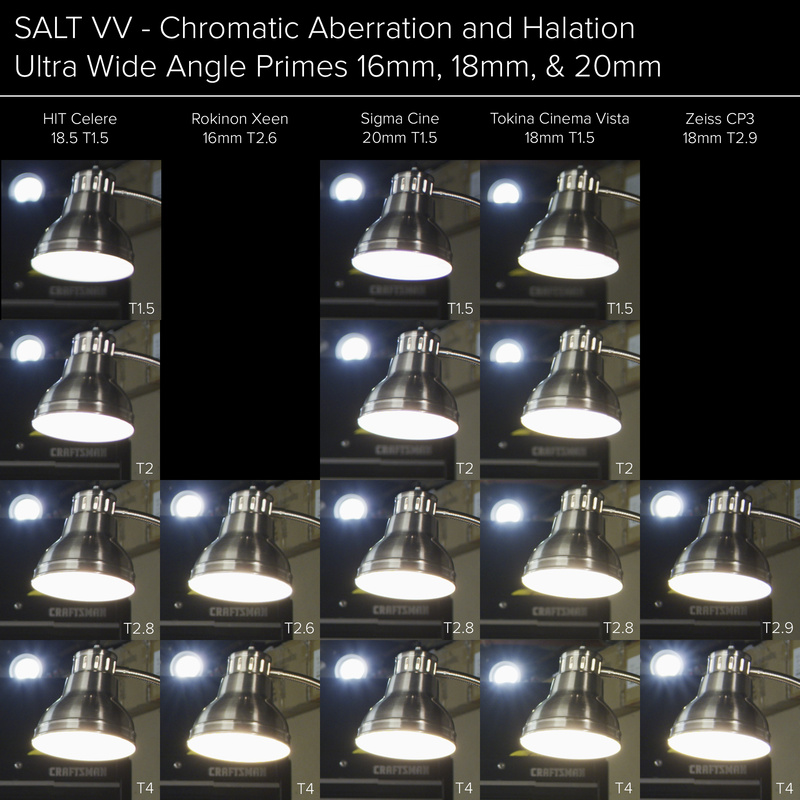 Coverage was excellent across all focal lengths in the VV frame. The CP.3 we tested were the earlier version, not the XD, but the glass will not change between the two. Right off the bat, the ultra-wide 15mm was the closest competitor to the Sigma 14mm and it didn’t disappoint, especially with such a large format as VV. Not too many surprises here as most of the glas in the CP.3 is inherited from the CP.2 with the exception of the 18mm, 50mm, and 85mm which are all new designs that don’t disappoint. The size and weight of the CP.3 is excellent! The focus rotation is generous and a vast improvement over the CP.2. The rotations is smooth and light to the touch. There were some odd anomalies in the 50mm towards infinity focus which appeared to be a reproduction of the sensor pattern or the OLPF, not sure here… But worth noting. The only other downside to the CP.3 is their relatively slow speed. 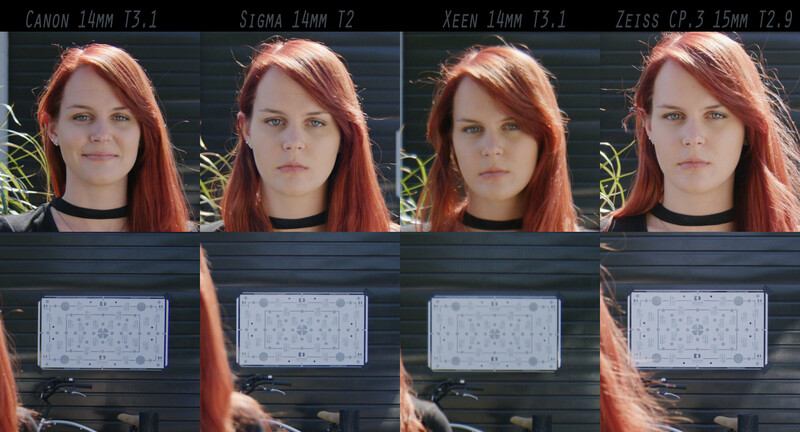 T2.1 was among the slowest in our test for the “normal” focal lengths. Possibly the most accurate primes of the test, the Otus are unrelenting in their image quality. They’re tack sharp corner to corner and eliminate nearly all aberrations. They are still photo lenses so they will suffer from focus breathing and a short focus throw, but as far as sheer resolution, the Otus take the prize. Some may even go as far as calling the Otus primes “boring” since there’s little to no flaws to them. This results in a very clean, accurate image which, depending on what you’re shooting, can really be an asset. VFX shooters will love the Otus for their clean slate style. Onc of the only discernable styles of note would be the slightly cool color reproduction. Interestingly I find myself in the rare position where I've been filming in the RED VV format for nearly two years and I even own the vast majority of these lenses. Much of this is a refresher for me as I've done tests as each set was released, but this is the first time I've been able to do proper side by side comparisons. However, in the case of several of these sets, I know what I like about them from practical shooting experience filming on RED's Dragon 8K VV Sensor and soon Monstro 8K VV. The Canon CN-E Primes have been out for a long while now and share the general 114mm stuby Zeiss CP.2 design. In this case, we had on hand Duclos's modified-to-PL Mount lenses, which solves one of my larger issues with these as a production set. Outside of that the build quality is good and the mechanics are decent. Optically these are based on their still lens EF Mount relatives, which I own all of, and are mostly similar on a pure optical level. Character-wise I find the speeds all play nice together and you have that extra range in a pinch with the 14mm and 135mm. They exhibit a moderate and manageable level of CA, but over all draw fairly nice. The bokeh is also pleasing, which has led to much of their success. I'd like to see Canon take another stab at these as they have a few improved optical designs, like the 35mm. They cover VV pretty well with the 14 and 24 having a smidge of color vignette at 8K FF, which could be the housing of the lens itself, but clears up when stopped down. In the VV HD format/aspect ratio you won't see that at all. These Celeres are a mixed bag for me. I'll focus on what I like first. I dig the intention of the housing and optical tweaking effort in what they are aiming for in regards to keeping the lenses all the approximate same weight. However, this is the 3rd set I've seen and I have not been blown away by the mechanics. In fact, the 36mm we had on the test day was completely locked up. The 18.5mm and 25mm porthole at full 8K FF on the VV and I've informed HIT about this, the base optics they are using do actually cover fine. All of the primes exhibit moderate to slightly more CA, which improves as always when stopped down, though the CA character is a bit “varied”. Much like the Gecko-Cam Genesis G35 Primes this is a rehousing effort with a little bit of added flavor. In this case they are alarmingly similar to most of the Xeens in performance and the 20mm Sigma Art series in particular. I'm not against the concept of “modding” in this way, but a bit more clarity would be nice. 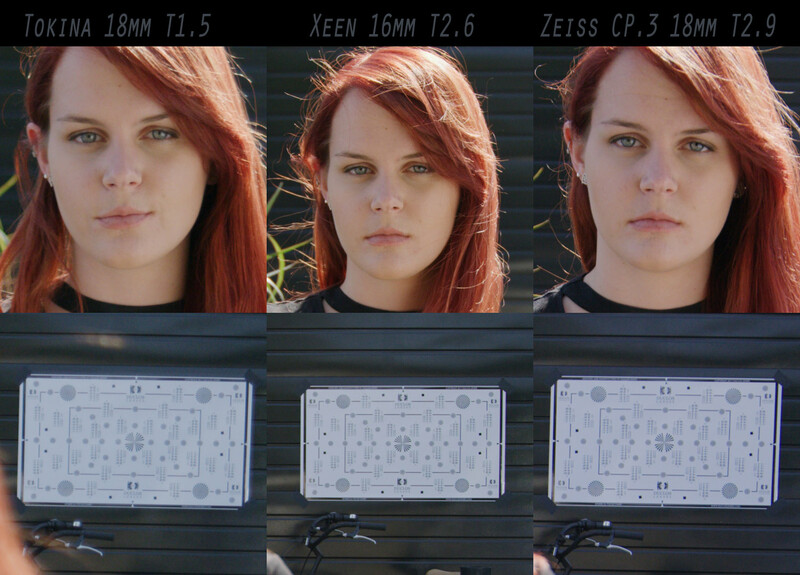 The Xeens represent the “budget-est” option out of the lenses we tested. They have some issues on mark repetition, which comes down to mechanics. Also experienced some tolerance issues on a few of the PL mounts, mostly super tightness. They are the standard 114mm front and general size of the CN-E and CP.2. The 14mm doesn't cover 8K FF cleanly, however the 16mm mainly has a noticeable vignette and I would say one of the more radical chromatic hoop lens flares I've seen in a while. CA is moderate overall and shares some similarity focal length to focal length with the Canon CN-Es, just a different look and draw. The Xeens are based on their DS and still counterparts and perform mostly identically. The Xenon FF-Primes one of two “purpose designed for cinema” sets we tested. I also own a set of these and they land somewhere between a modern and vintage prime set in my mind, and it's a look I generally like. It's like the mid-90s danced with the early 80-s if you catch my drift. They'll exhibit more CA than say a Sigma Cine Prime, but cleans stopped down as expected. The 25mm vignettes at 8K FF on the VV, which could be the housing. However on the plus side, I'm very fond of having a 75mm prime. There are only two options of 75mm for the VV, Schneider Xenon FF and the other being Cooke S7. The lens flare is generally very pleasing and bokeh is also rather nice. I truly with we had the 18mm on hand to see if it covers decently, I'll have that info shortly either way. I also heard that there was a longer lens coming to flesh out this set nicely. To say this is a strong effort by Sigma for their first cinema lens set would be an understatement. Sigma has rehoused their rather nice and popular Art series primes into compact cinema primes with 95mm fronts. The housing and build quality is solid and marks are nice and clear to read. I like these a lot and own a set. However, I do have a few wiggles. The ramp up on the focus pull near close focus is rather jarring compared to most cinema optics, not a huge deal, but if you are pacing your pulls take note. The 14mm prime breathes a fair bit compared to the rest of the set, which I don't find as a major issue. It also vignettes a small bit in the absolute corners at 8K FF on the VV. For anybody using these you'll want to go to donuts on the matte box for the 14mm and 20mm as they are very wide and will see most clamp on rings. 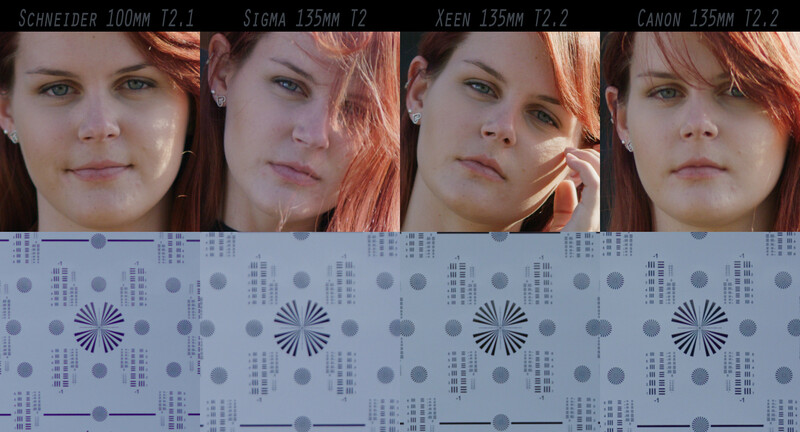 The Sigma Cine's have a nice consistent look otherwise with a very controlled flare. I'd say CA lands on the minimal side and in general these have a cleaner look with pleasing bokeh. Also notable, Sigma has one zoom to pair with the VV at the moment, the 24-35mm T2.2. I imagine more on the way. The other of the purely purpose designed for cinema sets we tested and in this case the very first set truly designed for the image circle of RED's VV format, in fact they cover generously larger even still. Cooke S7s are the other set designed purely for this VV format btw. I own and use these very often on my VVs and they are also Tokina's first extremely impressive move into the cinema market. They land on the larger side of things with the 18mm being on the bigger side still. However, one thing is easy to say here, the Tokinas breathe the least out of all of the lens tested and is indeed one reason I enjoy shooting with them. Our 18mm and 25mm primes were prototypes, and I appreciate Tokina allowing us to show them, they are incredibly impressive. They certainly land just a bit on the cleaner side, but certainly have more character wide open than Sigma Cine and Zeiss Otus, which sets them apart. The 50mm is particularly prone to point source flare, which is something Tokina is looking at. Otherwise I truly enjoy shooting with these, they “feel like” the right sort of draw for VV in some ways if that makes sense. There's a longer focal length coming in 2018 to expand the set. The full set is T1.5, but Tokina does indeed have a nice T2.9 100mm macro lens that plays well with this set as well as a 16-28mm T2.9 zoom. Zeiss was the first “in the game” of cinema prime lenses at this price point. The CP.2s were built on the backbone of ZE/ZF primes. However, a lot has happened since. Zeiss has created a new Milvus line with entirely new optical designs for some some of the dated classics focal lengths, while keeping and tweaking some of the newer already rather nice primes. The CP.3s are a follow up to the CP.2s and there are some pretty big differences. First, they are smaller and much lighter weight. In fact, this is the set I would recommend for handheld and/or drone/gimbal use. Also Zeiss is offering an XD version that feeds out Cooke I/Tech metadata, which is the first time anything like this has been made available at this price point. I will say the focus pull on the CP.3s is as close to a Master Prime I've ever felt on a prime set at this price point. That's a huge improvement over the CP.2s in my mind. We didn't have every focal length on hand, but I have tested these a great deal. Minimal breathing with moderate to minimal CA overall. The new 18mm design really fleshes out the set just right and complements the 15mm nicely. Also the new optics in the 50mm and 85mm are pretty clearly evident if you've used the CP.2s before, big improvements there. While these aren't high speed primes, they are probably the most complete standard set out there. Now with the newer higher speed Milvus primes released, I do wonder if Zeiss has some high speed options coming. These will complement the Compact Cinema Zooms that Zeiss also offers for larger format coverage. Matthew knows how fond I am of these primes on an optical level. They are truly superb and somehow straddle the line between a clean lenses and a beautiful ones. 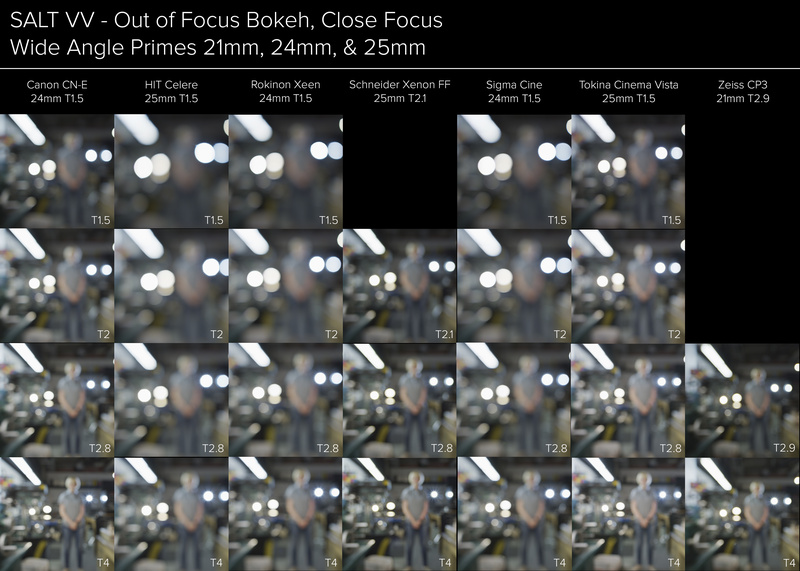 The have the least CA out of all of the primes tested, but they also feature a absolutely wonderful draw and level of edge contrast while also producing some extremely pleasing bokeh. They are controlled, but can produce a subtle lens flare. These were some of the first lenses I used on VV back in January 2016 and I've shot a great deal with them since thanks to Duclos's hard work on an impressive Cine-Mod that provides the 114mm fronts and metal focus gears. The focus pull on the 55mm and 85mm are rather nice for motion picture work, however the 28mm features an aggressively fast pull that isn't exactly the best. I hope Zeiss continues to develop more focal lengths for the Otus line and when the time comes properly house them. The 28,55, and 85mm make up a nice wide, normal, short tele set on VV which is why they are a workable basic set and I've been fleshing out the set with Zeiss 15mm and 135mm. These also have pair nicely with my CZ 28-80mm T2.9 zoom. I think the coatings in general for all modern Zeiss glass is built to match pretty well. This set of lenses is based on tried and true Canon designs but they are starting to show their age. Wide open sharpness is pretty good except for the 85mm but CA control is among the worst tested. Breathing is acceptable. Color character is classic Canon pastel/warm with green/blue flares. Barrels are solid with the best marks of the tested lenses, and they glow! These lenses struck me as not up to the build standards of the others tested. The barrels did not focus smoothly and the 35mm would not focus at all and was omitted. 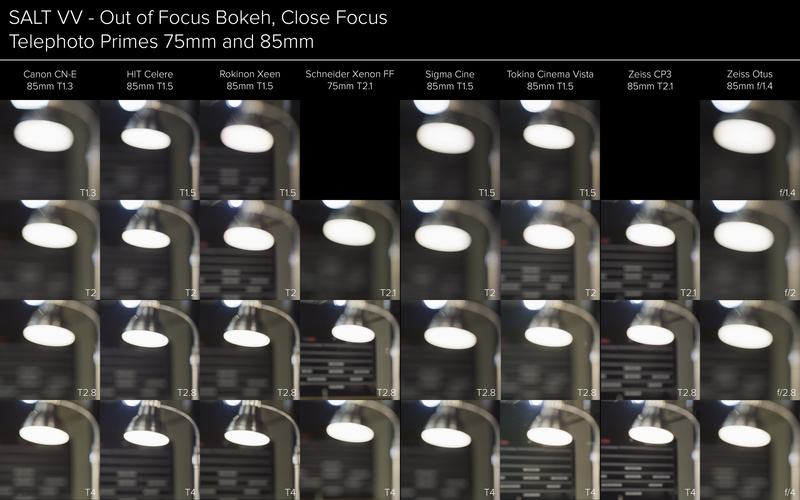 It’s also clear that the optics and lens formulas are derived from the Rokinon lenses (24-85mm) and the Sigma (20mm). There seems to be some re-coating or otherwise re-manufacturing going on since the Celere’s exhibit a generally softer, smudgier character wide open than the Xeens, but have a very similar draw at T2. The Color character is also cooler that the Xeens with blue/orange flares. The Xeens offer a pretty significant bang for buck. They offer pretty admirable sharpness wide open (with the exception of the 14mm). The 24mm is the weakest and may show some decentering but it’s still usable wide open on VV and at T2 on Helium. CA control is pretty close to that of the Sigmas with the 85mm holding out till T4. The 135mm is the best of all we tested in both sharpness and CA control. Breathing is again noticeable but not distracting given the still lens heritage. Color character is neutral/warm with yellow/blue flares. Barrels are big but lightweight and uniform in size. Mechanics are smooth and solid, marks are adequate. The Xenons are acceptably sharp wide open with the 25mm being the stand out. Their biggest issue is the considerable purple fringing they exhibit till at least T4. Breathing is noticeable but not extreme, color character is cool/magenta with blue/magenta flares. Barrels are solid with nice engraved marks and uniform sizes. These lenses were the breakout stars of this test in my opinion. All of them displayed impressive crispness wide open and fairly good CA control although they did exhibit some purple fringing it was well under control by T2.8. They have still glass DNA so there is moderate breathing but nothing particularly distracting. Overall color character strikes me as yellow/warm with yellow/orange/blue flares. Barrels are nice and compact with lovely cam focusing. Average weight. Given that these are the only purpose built cine lenses in the test they offer some interesting features. Wide open performance does not seem to be the primary focus (Pun intended) since they do seem a touch soft at T1.5 but sharpen up nicely by T2. They do however display extraordinary CA control showing negligible purple fringing even under very challenging conditions. They also display very low distortion and breathing. VV coverage seems ample as well. Color character is a bit yellow/warm with green/blue flares. Lenses are extremely heavy and very solid with great mechanics and marks. This is another set of lenses whose optic formulas have been in service for many many years. The wides (15,18 & 21mm) are all excellent performers wide open, although they only open to T2.9. The med lengths (35, 50 & 85mm) may be getting long in the tooth, though the 35 and 50 show acceptable wide open performance they display quite a bit of CA and breathing. Color character is classic Zeiss cool with blue flares. Barrels are nice and compact, solid and with ample marks and data ports! These adapted stills lenses are impressive in their CA control and sharpness. The only exception is the 28mm which gets crisp at T2. Overall color character is Cool Zeiss but warmer than the CP.3s, blue flares still present. The barrels are not cine (although Duclos can help there) so marks are far and few between although build is solid and focusing is smooth. Lens choice is always subjective from shooter to shooter. We all have different styles, looks, budgets, and characteristics that are important to each of us. I feel nit-picky writing my thoughts on the following lenses, because they are all capable. We are fortunate to live in a time with so many options! Thanks so much to Matthew Duclos of Duclos Lenses for putting this on and Phil for bringing his VV Weapon to really stress test these lenses on arguably the best cinema camera in the world. To me these get edged out by the Xeen’s. The CNE lenses show a fair bit of CA and for the price, I’d go with the Xeen’s. If you’re already in Canon world, then you’re used to how these lenses perform and it’s the look you are accustomed to. I personally was confused by this set. I have heard a lot of good things about them but was surprised by the results from our shootout. These lenses are low contrast, not very sharp, and handle flaring worse than any of the other sets. Those may be features that other shooters may really enjoy. Personally, I would rather shoot on something like the Sigma’s and create this look in post. To me they were the worst performing and the least feasible for purchase for me as a shooter. They are a great size and weight, but the mechanics were not great. I really wanted to like these but find it hard to recommend them. For the price, these lenses are a great value. Defiitey not on an elite level like the Sigma’s and Tokina’s, but this set came in 3rd place for me. The non-matching T stops and the 14mm and 16mm vignetting on VV Weapon is the biggest negative of the set for me. That and this set shows CA more than the previous two sets. But again, for the price…. This is a well built set with consistent t stops. Although slower as a set than most of the other lenses in the shootout at t2.1. To me these have a lower contrast look than the Sigma’s, Tokina’s, and Otus lenses. They do not resolve as well either and show a fair amount of CA. I like their consistent size and weight. That comes in handy on a lot of productions and is a lifesaver on lens switches on gimbal setups. Sigma, Sigma, Sigma! I absolutely love these lenses. They include a full range of high speed, full frame lenses that resolve a great deal of detail. For me their size and weight are ideal for almost every project. In terms of consistency in a set, my money goes to the Sigma’s. I’m not a big fan of lens sets that have varying t stops. The Sigma’s are all consistent with the exception of the 14 and 135 at a t2. The Sigma’s have great contrast, great flare control, very sharp, and very well built mechanically. I like the way they falloff into out of focus and they have great bokeh. If you can’t tell, I love this set. For the money these would be my number one choice. They are what I would call my Master Primes of the sets we tested, although in a much smaller and lighter package. It was great to see that all the lenses in the set including the 14mm cover VV Weapon. My 2nd choice based on pure image quality and mechanical build. These lenses are sharp, though not as sharp as the Sigma’s, fast, have good contrast, and great bokeh but the downside for me is their size and weight. These things are HUGE and HEAVY. I’m not exaggerating! These lenses would be tough to utilize on a gimbal. If not for their size and weight, it would be a close call for me between the Sigma’s and the Tokina’s. Inconsistency is still plaguing the CP.3’s. These lenses have been recycled over and over again. If you’ve shot with CP.2’s, you get the idea. I’m waiting for a full Milvus set cinevised or rehoused. Well built, great size, just nothing too exciting here from Zeiss. Great lenses, just not true cinema lenses and not a complete set. Only having three lenses in a set is frustrating. Overall image quality is excellent. Very sharp, pretty much non-existent CA, and great contrast with flare suppression. My only knock is the price na dan incomplete set. So much hard work into this. Thank you so much once again for this amazing DP public service !! In addition to the indoor VV portion of this test we also shot an outdoor section of the test on the 8K S35+ Helium. 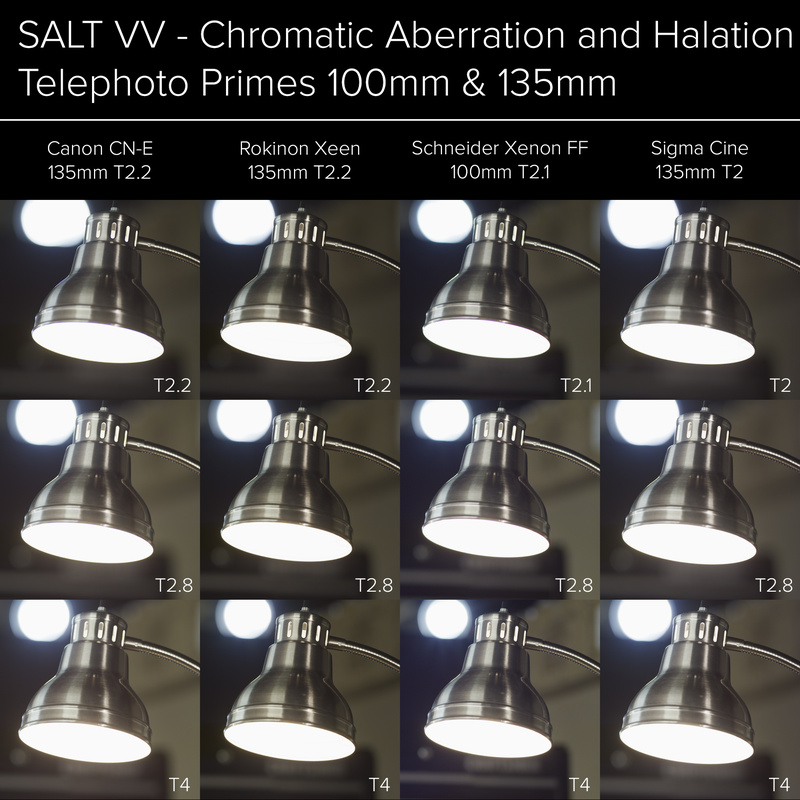 The higher pixel density of the Helium sensor seems to be a bit more demanding on optics, especially for chromatic aberration but also for sharpness. 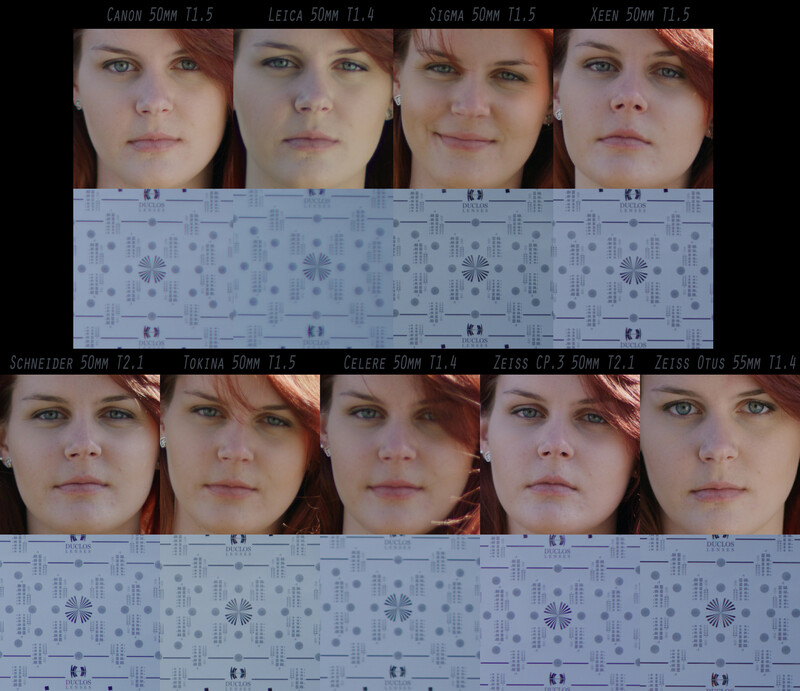 Below are 100% comparison matrices of the closest focal lengths. These are from 4K Jpeg snapshots out of RCX50, I also included full 8K R3D snapshots if you want to dig deeper. I did my best to keep things consistent but shooting this many lenses outdoors in a timely manner is going to introduce some variations in lighting and color. 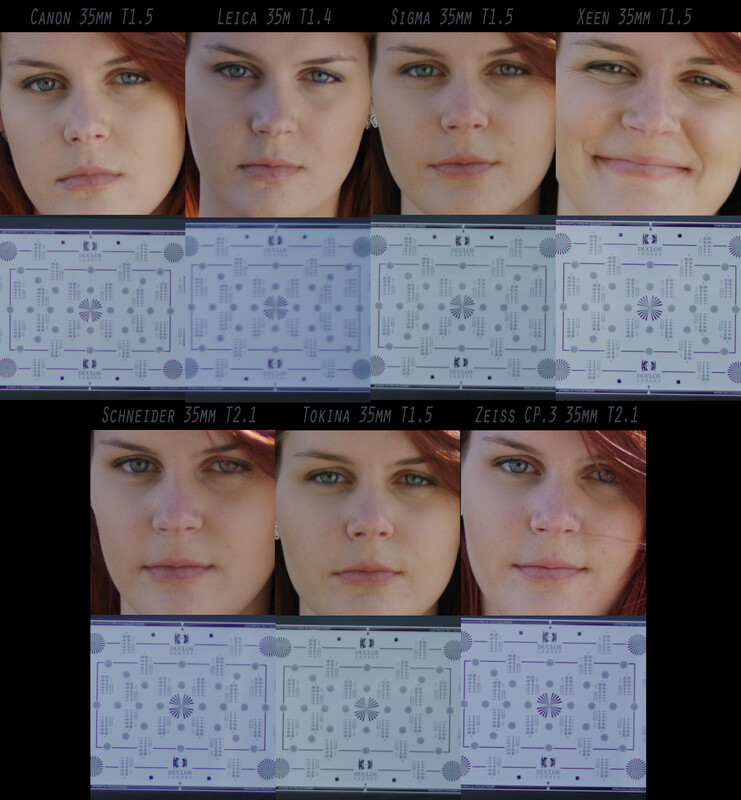 If you're looking for critical differences in color rendering download the R3Ds and compare with similar settings. Also if you dive into the files you'll notice there are snapshots from wide open and then snapshots at varying apertures. I chose to include those apertures where I felt the lenses sharpened up noticeably from wide open (if they did not I did not include and more) and also where the CA on the chart get under control. Last edited by Evin Grant; 11-15-2017 at 10:48 PM.